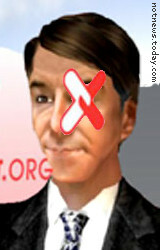 That’s Peter Mandelson’s actual Second Life avatar, and that’s the actual LabourList logo: a bleeding band-aid. Press-release photo. The poster asserts that the use of the photo and logo are fair use under US law for purposes of political and satirical commentary.